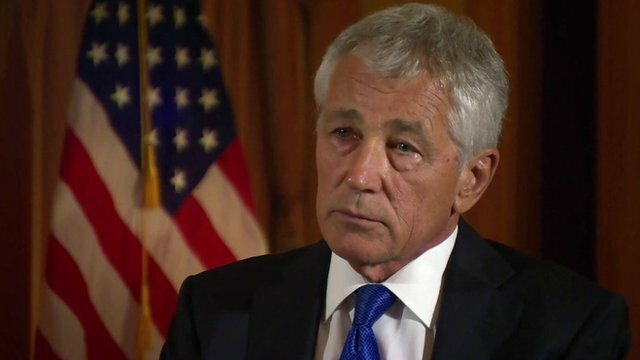 The US forces are “ready” to launch strikes on Syria if President Barack Obama chooses to order an attack, Defense Secretary Chuck Hagel announces. “We have moved assets in place to be able to fulfill and comply with whatever option the president wishes to take,” said Chuck Hagel. US Secretary of State John Kerry has said there is “undeniable” proof that Syria had used chemical weapons. Britain is considering military responses to the attack. British PM David Cameron, who has cut short his holiday and returned to London, said MPs would vote on a “clear motion” on the crisis. Syria’s allies, Russia and China, have stepped up their warnings against military intervention in Syria, with Moscow saying any such action would have “catastrophic consequences” for the region. Meanwhile Syrian Foreign Minister Walid Muallem said he rejected “utterly and completely” claims that Syrian forces had used chemical weapons. The Syrian government has blamed rebel fighters for the suspected chemical attack, which took place on August 21 near the Syrian capital Damascus, and reportedly killed more than 300 people. On Monday, UN chemical weapons inspectors were fired on while investigating one of the five alleged attack sites around Damascus. Chuck Hagel said the US Department of Defense had provided President Barack Obama with “all options for all contingencies”. He said that intelligence currently being gathered by the UN inspectors would confirm that the Syrian government was responsible for the chemical attacks last week. Chuck Hagel’s remarks come a day after John Kerry accused the Syrian government of destroying evidence of its chemical weapons use in Damascus by shelling the area. He said his administration had additional information about the attacks that it would make public in the days ahead. John Kerry described the assaults as a “moral obscenity”. “What we saw in Syria last week should shock the conscience of the world. It defies any code of morality,” John Kerry said at a news conference on Monday. The UN Security Council is divided, with Russia and China opposing military intervention and the UK and France warning that the UN could be bypassed if there was “great humanitarian need”. Russian President Vladimir Putin said there was no evidence that an attack had taken place or who was responsible. Libya 2011: France and UK sought UN Security Council authorization for humanitarian operation in Benghazi in 2011. Russia and China abstained but did not veto resolution. Air offensive continued until fall of Gaddafi.